The matches have been played, opponents have met at the net to shake hands and the winner for the spring season of Team Tennis 12 and Under Intermediate is Ahwatukee Tennis Club. The team posted an impressive 6-0 record versus The Village, Arrowhead Country Club, Red Mountain Ranch Country Club, Gold Key Racquet Club, Kiwanis Recreation Center and Winfield Tennis Club from April 6 to May 18. The format of traveling team tennis includes boys and girls singles, boys and girls doubles and mixed doubles. Everyone gets a chance to play and the kids feel like they're on a Davis or Fed Cup team! Team Ahwatukee went 6-0 with 28 individual wins and eight individual losses. The team also scored an impressive 183 total games won, surpassing second place Arrowhead Country Club by 24 games. The Ahwatukee team consists of boys Roman Shenkiryk, Christian Franco, Zachary Lawson, Yusuf Saleem and Brandon Durgana; and girls Delaney Nothaft, Victoria Franco, Melissa Kahn and Kennedy Farnsworth. The team was captained by Myron Shenkiryk. 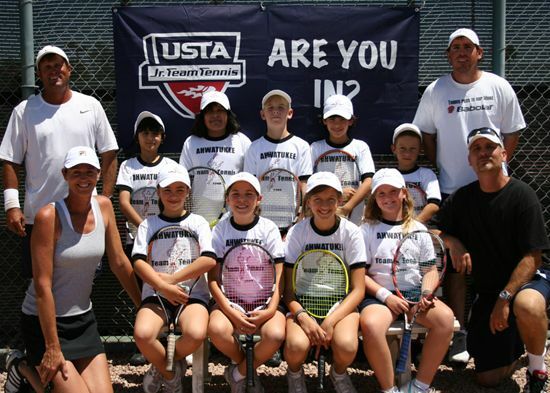 The players are coached by the Ahwatukee Tennis Club staff, which includes Mike Henneberry, Mike MacKay and Tracy Lawson. For more information, click here.